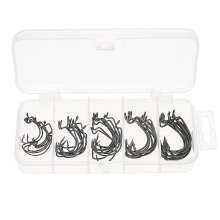 A combination of sharpened barbed hooks of different size to meet your need and provide a pleasant fishing experience. 50pcs 5 sizes, 2/0#-10, 1/0#-10, 1#-10,2#-10, 4#-10. High carbon steel material, durable and antirust for years. Easy to store and carry for different sizes separated and packaged in a box. Sharpened barbed hook ensures a better penetration and increase the hook-ups. Perfect accessories for fishing lovers.